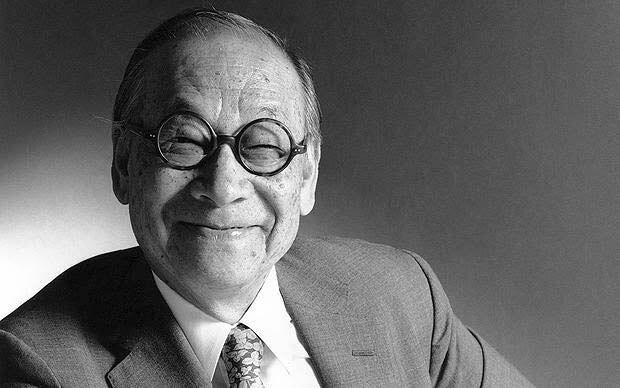 Ieoh Ming Pei is a Chinese American architect born on April 26, 1917 in Suzhou, China. Son of a bank director, Pei moved to the United States at the age of 17 to pursue his passion for architecture. At first he got admission at the University of Pennsylvania but its emphasis on fine draftsmanship could not go in accordance with Pei’s interest with structural engineering so he got enrolled at the Massachusetts Institute of Technology (MIT) and received his degree in Bachelor of Architecture in 1940. In 1942 Pei started attending the Harvard Graduate School of Design and completed his M.Arch in 1946. Along with that he started serving as an assistant professor in the same campus and stayed there from 1945 to 1948. Right after that at the age of thirty one, Pei was hired by a huge New York City contracting firm Webb and Knapp to direct the architectural division. This phase played a great role in giving his career a refined form as he himself said that he learned to consider the big picture after working at Webb and Knapp. He learned working with community, business, and government agencies and got several opportunities to work on some large scale projects.